MALL REDEVELOPMENT 148 • SHOPPING CENTER BUSINESS • May 2018 Mall in New York. Sears will continue to operate its store but in a smaller footprint. "We didn't want Sears to go away. It does very well in this location, but it need- ed to be the right size," says Doug Adams, GGP's senior director of development. 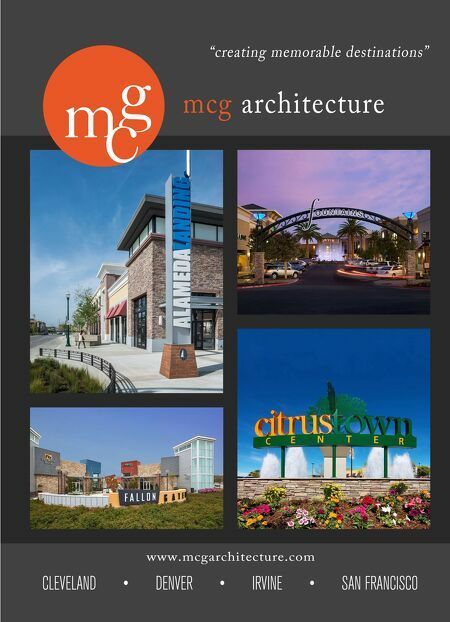 GGP's redevelopment of the nearly 1.3 million-square-foot enclosed mall will add 242,000 square feet of retail space. The project will also include repurposing approximately 180,000 square feet of an- chor space. Mall owners like GGP are rethinking their approach of how to effectively inte- grate department stores into their malls. 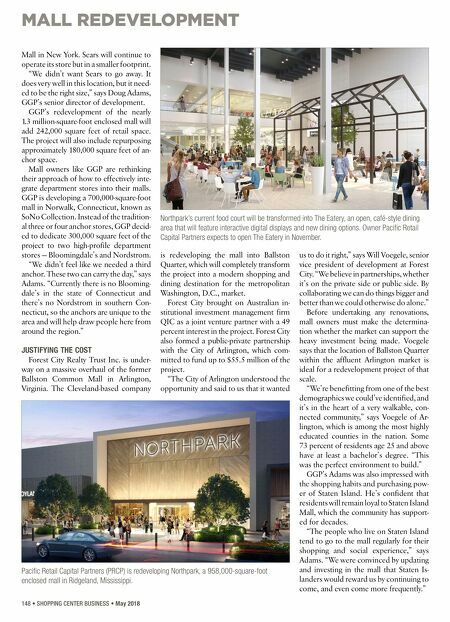 GGP is developing a 700,000-square-foot mall in Norwalk, Connecticut, known as SoNo Collection. Instead of the tradition- al three or four anchor stores, GGP decid- ed to dedicate 300,000 square feet of the project to two high-profile department stores — Bloomingdale's and Nordstrom. "We didn't feel like we needed a third anchor. These two can carry the day," says Adams. "Currently there is no Blooming- dale's in the state of Connecticut and there's no Nordstrom in southern Con- necticut, so the anchors are unique to the area and will help draw people here from around the region." JUSTIFYING THE COST Forest City Realty Trust Inc. is under- way on a massive overhaul of the former Ballston Common Mall in Arlington, Virginia. The Cleveland-based company is redeveloping the mall into Ballston Quarter, which will completely transform the project into a modern shopping and dining destination for the metropolitan Washington, D.C., market. Forest City brought on Australian in- stitutional investment management firm QIC as a joint venture partner with a 49 percent interest in the project. Forest City also formed a public-private partnership with the City of Arlington, which com- mitted to fund up to $55.5 million of the project. "The City of Arlington understood the opportunity and said to us that it wanted us to do it right," says Will Voegele, senior vice president of development at Forest City. "We believe in partnerships, whether it's on the private side or public side. By collaborating we can do things bigger and better than we could otherwise do alone." Before undertaking any renovations, mall owners must make the determina- tion whether the market can support the heavy investment being made. Voegele says that the location of Ballston Quarter within the affluent Arlington market is ideal for a redevelopment project of that scale. "We're benefitting from one of the best demographics we could've identified, and it's in the heart of a very walkable, con- nected community," says Voegele of Ar- lington, which is among the most highly educated counties in the nation. Some 73 percent of residents age 25 and above have at least a bachelor's degree. "This was the perfect environment to build." GGP's Adams was also impressed with the shopping habits and purchasing pow- er of Staten Island. He's confident that residents will remain loyal to Staten Island Mall, which the community has support- ed for decades. "The people who live on Staten Island tend to go to the mall regularly for their shopping and social experience," says Adams. "We were convinced by updating and investing in the mall that Staten Is- landers would reward us by continuing to come, and even come more frequently." Northpark's current food court will be transformed into The Eatery, an open, café-style dining area that will feature interactive digital displays and new dining options. Owner Pacific Retail Capital Partners expects to open The Eatery in November. Pacific Retail Capital Partners (PRCP) is redeveloping Northpark, a 958,000-square-foot enclosed mall in Ridgeland, Mississippi.